Alaska Rep. Zach Fansler visits Tundra Villages - The Delta Discovery, Inc.
Top and bottom photos: Students at Anna Tobeluk Memorial School in Nunapitchuk listen to Rep Fansler answer their questions about Alaska State government last week. He discussed with them on how stay informed about issues his office is working on and how to contact him. Rep. Fansler also met with community leaders and members that evening. Nunapitchuk, Alaska – As part of his commitment to stay connected with his constituents, Alaska State Representative Zach Fansler made a swing through the tundra villages this week (Dec. 5th, 2017). 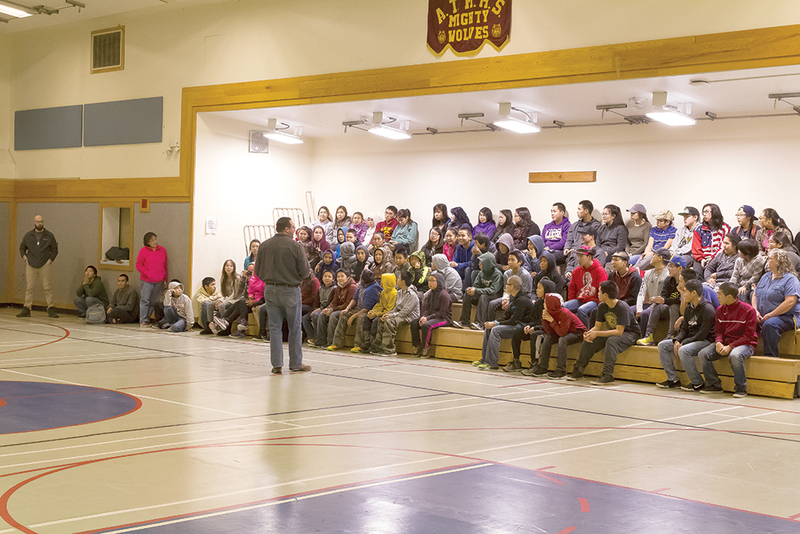 Weather derailed the planned visit to Atmautluak, however, Rep. Fansler was able to make the trip to Nunapitchuk on Dec. 5 and speak with students at Anna Tobeluk Memorial School as well as meet with interested community members in the evening. Fansler told the students, “I’m here to visit with you because, in a way, you’re my bosses.” He also provided information about how state government works and told about the committees he serves on and basic information about legislation he is guiding toward passage. While the Representative was touring the school, he took the opportunity to speak with teachers and students; at lunchtime he ate with the kids and had time to talk with several people. While speaking with interested community members in the evening, Rep. Fansler was able to spread the message that he wants to be informed about challenges that the villages in his district are facing, and he wants to be involved in finding solutions to those problems. Questions from the audience included revenue sharing, law enforcement, public works construction projects, and education funding. Rep. Fansler distributed information about how to contact him and his office, and gave interested people a chance to subscribe to information updates from his offices in Juneau and Bethel.